While there are certainly advantages to sharing one’s reading experiences globally using Goodreads or a similar social platform, to show my students that teachers are readers too, I purposefully chose the old-fashioned route: poster collages. My initial goal was to create a visual record of my and my colleagues’ reading in order to model for our students that their teachers embrace their roles as readers. Moreover, based on the premise that reading is social, I also wanted to foster a community of readers within our small school. The poster collages are a quick analog way to identify, inform, and share information about the books in our lives. So at the beginning of the school year, I invited my colleagues to participate simply by emailing me the title and author of books (professional and pleasure) read during the course of the school year. I printed the images of those book covers and glued them to posters I had created for each participating reader. Since many of my library walls are floor-to-ceiling glass, they lend themselves perfectly for display. On their way to lunch or PE, our students would regularly walk past those book posters. I noticed them looking, pointing to different book covers, and commenting that their teachers were reading a lot. In fact, one boy seemed to think that our Vice Principal and I were in a competition–one I was quickly losing as Morah Eta read at least two books weekend after weekend. 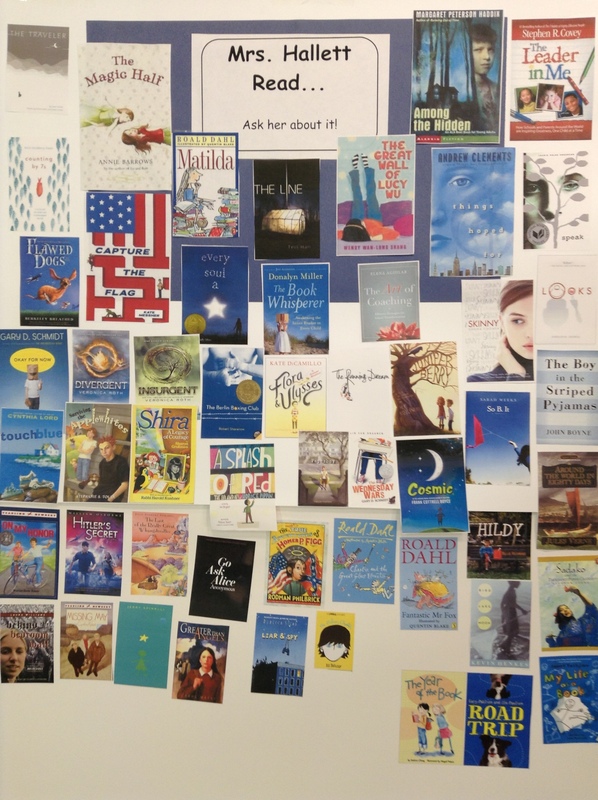 While the posters provided a fun way to see how quickly a list of books read can grow, it also became clear that many of our students liked to stop and look at the book covers to find recommendations for reading. In fact, not only were students connected with books, but parents asked about titles and faculty discussed books they had read. I found myself discussing adult books among colleagues with whom I had not discussed books before. The posters helped create a connection between faculty and students who share an interest in reading. They also helped our students see that reading is not just something they have to do for school, but rather is embraced by their teachers for pleasure.